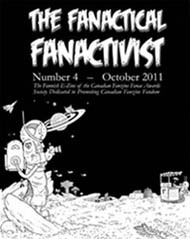 The Fanatical Fanactivist - ZineWiki - the history and culture of zines, independent media and the small press. Letters came from all the winners, as well as Dave Haren, Neil Jamieson-Williams (Swill), Jinnie Cracknell (Quantum B*llocks), Dave Haren, Neil Jamieson-Williams, Eric Mayer (E-Ditto), Sam McDonald, Murray Moore (Aztec Blue, Old Toys), Kent Pollard, Robert Runte (Neology, The Monthly Monthly, New Canadian Fandom), Garth Spencer (The Maple Leaf Rag, BCSFAzine, The Royal Swiss Navy Gazette), Felicity Walker (Ish, BCSFAzine), and Taral Wayne (Broken Toys, DNQ, Toronto the Ghood). This page was last modified on 10 January 2019, at 23:31.